The Gympie Region Tourism Discussion Paper was endorsed by Council in late October. The paper delves into data and observations on what’s working and what could be improved for tourism in our region. Unfortunately, it was published in November, as the paper was delivered, and comments were due in before December, despite advising Council of our coastal deadlines. The report claims that our coast is “stealing share” from Gympie City, and that sub-regions are “cannibalising” marketing initiatives. Why would a report that it is trying to create harmony across each corner of the region, use such inflammatory words? Tourism business owners on the coast do work collaboratively, and those who I have spoken to would agree with the report that a “visitor dispersal strategy is about growing the entire pie for the benefit of all sub-regions”. The fact is, travellers know the names Rainbow Beach or Tin Can Bay, Gympie is not on their radar yet. As the report suggests, “Gympie City increasingly has become a utility destination where visitors drive ‘through’ rather than drive to”. It stresses that it is vital Rainbow Beach’s visitor numbers are not jeopardised, and that their maintenance or growth are of “equal priority” to visitor dispersal region wide. Last year 499,000 visitors contributed $221 million to the Gympie region economy. Over the last 10 years, domestic visitation (accounts for 90 percent of all visitation) to the Gympie region increased by 39%; almost double that of Queensland’s entire tourism growth rates, which grew by 20 % over the same period. With less staff and marketing budget, the Gympie region is also outperforming many Queensland regions in attracting international visitors from UK and Germany (12,000 and 10,000 visitors respectively). The tourism sector accounts for 11 per cent of all businesses in the region and employs around 1,078 people, predominantly females between the ages of 26 and 44. Most employees are part-time and 66 per cent have no formal qualification. 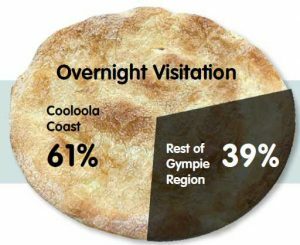 Cooloola Coast sub-region, at 61 per cent of all overnight visitation, has dominated visitation to the region over the decade. The report asks that each area get behind the “ONE message”. I guess as long as that means we aren’t confusing people with the word Gympie, when we market Rainbow Beach or Tin Can Bay, that should work out fine! They want us to focus on experience development as opposed to marketing, so more travellers stay longer. For instance it says that a Kilkivan Church should be moved to Phil Rogers Park and refurbished with a “Montville Chapel” style. This would position Rainbow Beach as one of only “two” true beach-located churches in our state. It mentions the proposed Tin Can Bay Jetty, and the Mary Valley Country provide other backdrops for the lucrative wedding industry. The report calls for more paid tourism experiences in Mary Valley Country, Kilkivan and Goomeri to capitalise on the emerging food tourism or bike trail destination credentials we have. Definitely, RV travellers at the Gympie Rest Areas are guests of the region (it is not illegal as the document states). Correctly, the report does suggest they should be receiving the best of welcomes, and that Council find ways to extract more spend as they travel here. They ask us to consider the best location(s) for the region’s future Visitor Information Centres, as the highway is upgraded further, remove billboard signage and consider names of places. I believe the idea listed of changing the name of the Cooloola Great Walk, to the Great Beach Walk does capitalise on the success of the Great Beach Drive, and I like that the proposed Australia’s Nature Country works with our Australia’s Nature Coast. You’ll find the report on Council’s website; let me know what you think!